THE WRITING BUDDHA - Opinions | Books | Movies: Rightfully Wrong Wrongfully Right by Varsha Dixit (Book Review-2.5*/5) !!! 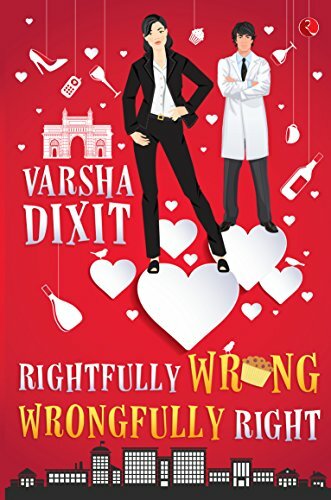 Rightfully Wrong Wrongfully Right by Varsha Dixit (Book Review-2.5*/5) !!! I had read Varsha Dixit's Right Fit Wrong Shoe more than 5 years ago and since then I didn't get any chance to read other novels that she published in between. I finally laid my hands up on her latest release named "Rightfully Wrong Wrongfully Right". The cover page of the book is very appealing which might result in the sales of this book. When I read the 1st book by Varsha Dixit, I got very confused as I was new to fiction reading and remembering the multiple characters just tired me as a reader. Comparatively, I found this book very sort out and easy to read. The characters are nicely built though few of them aren't used the way they could have been like Aditya’s. Varsha Dixit’s narration is very simple and she does not believe in complicating things for the reader. Right from the first chapter, you will find the series of the scenes and sub-plots well organized which makes pace of reading faster and gives the reader momentum. The characterizations are well done as I have mentioned in the first paragraph itself. The biggest hurdle for this book has been its predictability. A reader, at every step, will understand what is going to happen next. And too much time has been spent in things that should not have been described that minutely and descriptively. The love angle is beautifully managed except the predictable part. I also liked the initial few chapters where Gayatri is trying to be comfortable with a character with which she has bad equations because of something she tried to do to spoil her married life earlier. The recovering phase is also narrated nicely after Gayatri got attacked by few men on a dark road. Overall, this book is a light read which can be done in a sitting or best, carries with you while traveling. I give this predictable story an average 2.5 stars out of 5 as it has nothing new to deliver but is still a time-pass read.